OK, this is weird: The wealthier you are, the more likely you are to think the new tax law screwed you. Today isn’t the first time we’ve tackled the gap between perception and reality with the Tax Cuts and Jobs Act of 2017 — only last week we called it “the most hated tax cut in history” — but even our jaded eyes opened wide at figures from SurveyMonkey and The New York Times. First, a reminder that according to the Tax Policy Center, the TCJA delivered a tax cut to 64.8% of filers. That’s the reality. Here’s the thing: If your household income is under $30,000, you’re more likely to perceive your circumstances accurately: 30% of those folks thought they got a tax cut, and 32.1% actually did. $100,000 and up: 89.5% of filers got a tax cut, but only 46.4% believe they did. Yep. What have we been saying the last couple months about how the tax cut wasn’t made tangible or visible to the taxpaying public? And just wait until working stiffs fill out a “new and improved” W-4 form later this year. The IRS issued a rough-draft version of the form last summer. Gone are the exemptions that never made much sense and had little bearing on your actual tax liability. But added are a boatload of complications. You’ll have to guess at your interest and dividend income… your deductions and credits… and the income of your spouse, kids and other members of your household. The next draft is due by May 31 and this time it’ll be open for public comment — which we expect will be excoriating. The final version should be out by year-end — which won’t be any help at all for your 2019 taxes. Good luck! 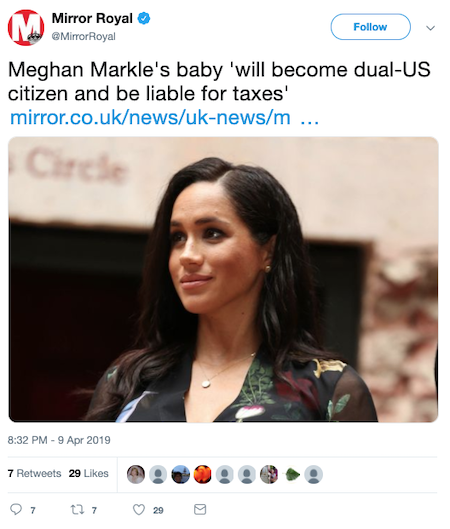 Meanwhile, the newest addition to the British royal family will have the “privilege” of paying American income taxes. The Duchess of Sussex — still better known as Meghan Markle — is a U.S. citizen. And thus so will her baby, due later this month or early next. That sounds like fine company to be in, no? “Any American who has lived in the U.S. in the last five years automatically passes on their citizenship to their offspring,” the Beeb continues. And it seems the duchess has to jump through the same hoops anyone else does before she can obtain U.K. citizenship. Once she does, she could theoretically surrender her U.S. passport. But not her child: U.S. law declares minors under age 16 are “presumed not to have the requisite maturity” to make that decision. As a practical consequence, “Children who earn under $2,000 can file their taxes with their parents’, but a royal baby will possibly have gifts and inherited assets that will have to be declared to the IRS,” says the BBC. 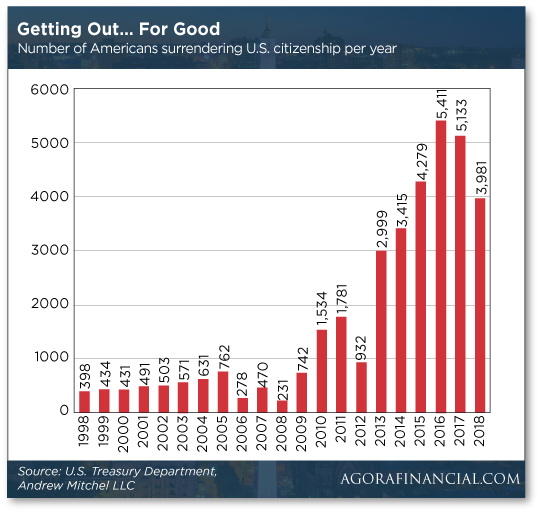 If the duchess eventually surrenders her U.S. citizenship, she’ll be part of a trend that’s exploded in the past decade… but is now leveling off. The 5 was early in spotting this trend, well before the mainstream caught on in 2012–13 when a handful of celebrities — notably Tina Turner and Facebook co-founder Eduardo Saverin — grabbed headlines for taking the big step. The reality, as we said all along, was that most people renouncing their citizenship were everyday folks earning pedestrian salaries who can’t afford to pay taxes to two nations. It’s true there’s an exclusion for the first $100,000 of foreign earnings. But merely filing a tax return while working overseas is overwhelming and expensive — typically costing $2,000 to do it right. What’s more, given the IRS’ onerous requirements on foreign banks with U.S. customers, most foreign banks want nothing to do with U.S. customers anymore. So why the drop since 2016, which accelerated last year? We can only speculate. Perhaps it’s the wealthy feeling less burdened by the new tax law. Perhaps it’s the not-so-wealthy who can’t afford the higher processing fee for renouncing citizenship: It more than quintupled in 2014 to $2,350. And the numbers on that chart aren’t the last word. They might well be understated. International tax lawyer Andrew Mitchel tracks these numbers more closely than anyone else. Two years ago, he spotted a curious anomaly. “During the first quarter of 2017,” he writes, “the FBI added 1,484 individuals who renounced their U.S. citizenship to the NICS index. The second trading day of earnings season is a snooze. The major U.S. stock indexes are in the red, but not by much. At last check, the Dow has shed 37 points to sit at 26,375. Gold is mostly steady at $1,288. The big earnings number of the day is Goldman Sachs: The vampire squid delivered a solid “beat,” but traders are still bummed that earnings are down 21% from a year ago. At last check GS is down 3%. The only economic number of note is the first one to include data for the month of April: The Federal Reserve’s Empire State Manufacturing Survey — taking the pulse of factory activity in New York State — came in better than expected, notching the best number in four months. On the subject of “universal basic income,” a reader writes, “Can you do a blurb in The 5 explaining how we aren’t socialist already? “The federal government regulates health care, education and transportation, as well as subsidizes them. Further, my household electric, gas and water bills are big-time regulated by the government. “No one in the Democratic Party is suggesting the government control what products or services are provided in the economy a la communism — only 5,000 Trabants produced this year, etc. “I cannot help but observe that we are not now — if we have ever truly been — in anything close to a true free market economy,” writes another. “Only those truly drinking the Kool-Aid from the left and the right could believe otherwise. Although in all fairness it isn’t like our schools teach economics. Those who stop their education after school are truly at a disadvantage. “In an ideal world, things would be very different. The natural state of things would be a deflationary environment in which the continual increases in productivity would drive the cost of living down further and further as competition and technology made life better for the masses. But our profligate politicians and central banks have insured that will never happen. The corporate monoliths that line their campaign coffers have no such interests at heart. The ‘powers that be’ are quite happy to have everyone as debt slaves. “They have just dressed it up as ‘freedom’ and the uninformed masses are drinking that stuff up like free margaritas an hour before last call. You do all the work. They take all your profits and (barely) leave you enough to subsist. But they let you think you have a choice with bank A; credit card company B; and utilities C, D and E; and because they allow you to pick your master people believe they are free. The greatest feat the devil ever pulled off was to convince the masses he doesn’t exist. “We are coming to an inflection point, though, that I refer to as the Productivity Paradox. We have become so good with automation and so productive that we no longer need everyone to produce everything that everyone needs. In my pocket I carry a smartphone that can replace all of what a small back office would have once been required to accomplish, to say nothing of what I can do on a relatively cheap desktop workstation, a printer and good internet connectivity. Simply put, we don’t have enough that we need people to do. Among government’s many misdeeds, this might be the worst: Government is serving to retard the evolution of mankind — and at a critical juncture. Anywhere on the globe that capitalism managed to get a foothold for a reasonable amount of time — and where war has not broken out — technology has reached a point of easily meeting the basic human needs for survival and safety. We’re talking food, clothing, shelter, heat. Indeed, there’s a fair amount of material comfort to be had with a minimum of effort. If you define wealth as something you either grow or mine or manufacture, we’ve got a working template now. 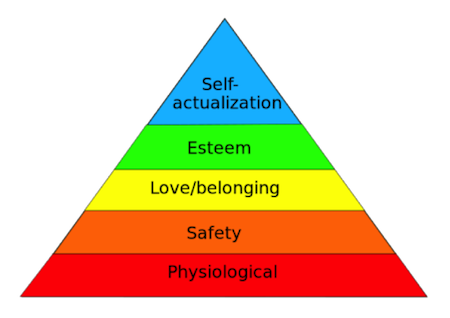 The bottom two levels on Maslow’s hierarchy of needs? Check ’em off. Done. Now, there’s not much that capitalism and technology can do about the next three levels. But it doesn’t need to. It’s already solved the conundrum of the first two. That should free us up to pursue the top three with alacrity, right? The four-hour workday that Benjamin Franklin envisioned in the 18th century should be our birthright by now. With the wonders wrought by capitalism and technology, there should be ample time we can devote to deepening our interpersonal relationships and our spiritual lives. To grow closer to each other and to God (however you might define that). Isn’t that the logical endpoint of human evolution after these many millennia of physical struggle? But no. The beast of government must be fed. So must all the parasites that require government favors — Wall Street, health care, higher education, the military-industrial complex. And behind it all, the dead hand of central banking and unsound money. P.S. Today will be the last time we remind you about the Rich Dad 2019 Tax Guide prepared by Robert Kiyosaki and his hand-picked team of tax pros. It’s stuffed with 91 tips and tricks that’ll help you keep more of what’s yours. Sure, you’ve probably filed already. But it’s not too soon to think about next year… and you might even learn something that makes it worth your while to file an amended return this year and get a check from Uncle Sam. You can claim your free copy at this link. And if you follow through on the offer at that link, you’ll get the 2020 edition as soon as it’s ready.